New York, NY – Just about any credible rap fan has Nas secured in their Top 10 MC lists. But just as much as he is respected as a brilliant wordsmith, he has long been criticized for poor beat selection. But what if the MC who arguably has the best ear in rap got to take the reigns for a record by God’s Son? Blogger Lindsey India wrote that while attending Wingstop event in New York City, she asked Rick Ross if he would executive produce a Nas album. Love or hate Ross, his ear for beats is undeniable. Since his sophomore album Trilla, the Maybach Music Group founder has carved one of the most distinctive sounds in rap. His lush beats from J.U.S.T.I.C.E. League further catapulted the Florida trio into one of the most sought-after production groups, and his bangers from Lex Luger stand out. But he doesn’t just rely on notable names. He puts together his albums and mixtapes the way fellow Miami resident Pat Riley makes up a basketball roster: a balanced mix of luxury, brawn and reflectiveness that always ends up working well as a unit. His collaborations with Nas have all had great beats as well, and Nas seems to always be at his best when they work together. “Triple Beam Dreams,” “Accident Murderers,” “One Of Us,” “Usual Suspects” – the duo is undefeated. Nas would need varied sounds for his album, and he likely wouldn’t make the type of music Ross makes. But he has proven that he is at his best when a producer can help him build a sound. Illmatic, his crowning achievement, had MC Serch picking the beats for Nas to lay his rhymes over. And No I.D. helped give Life is Good its perfect blend of reflection and nostalgia. 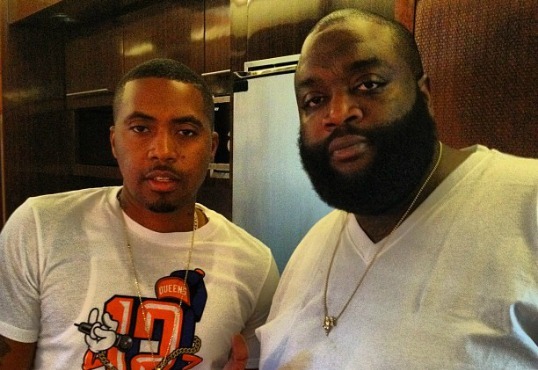 Maybe placing his album in Ross’ hand is exactly what Nas needs. Do you think should Ross executive produce a Nas album? Leave your answers in the comments.